After months spent roving across a sea of rippled sands, Opportunity reached an outcrop in August 2005 and began investigating exposures of sedimentary rocks, intriguing rind-like features that appear to cap the rocks, and cobbles that dot the martian surface locally. Opportunity spent several sols analyzing a feature called "Lemon Rind," a thin surface layer covering portions of outcrop rocks poking through the sand north of "Erebus Crater." In images from the panoramic camera, Lemon Rind appears slightly different in color than surrounding rocks. It also appears to be slightly more resistant to wind erosion than the outcrop's interior. To obtain information on how this surface layer (or weathering rind) may have formed and how it compares to previously analyzed outcrops, Opportunity is using the microscopic imager, alpha particle X-ray spectrometer and Moessbauer spectrometer to analyze surfaces that have been brushed and ground with the rock abrasion tool. Scientists will compare these measurements with similar measurements made on the underlying rock material. This is a false-color composite generated by draping enhanced red-green-blue color from the panoramic camera's 753-nanometer, 535-nanometer and 482-nanometer filters over a high-fidelity violet, 432-nanometer-filter image. The image was acquired on martian day, or sol 552 (Aug. 13, 2005) around 11:55 a.m. local true solar time. 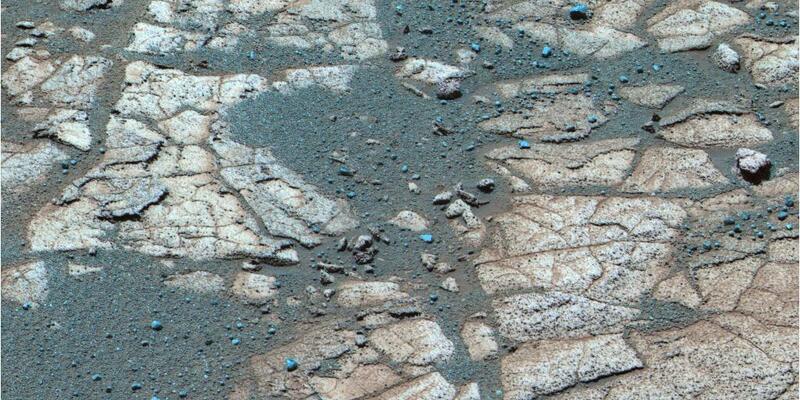 In this representation, bright sulfur-bearing sedimentary rocks appear light tan to brown, depending on their degree of dust contamination, and small dark "blueberries" and other much less dusty rock fragments appear as different shades of blue. Draping the color derived from the blue to near-infrared filters over the violet filter image results in a false color view with the sharpest color and morphology contrasts.